A flood along the Mississippi, as seen from on high. 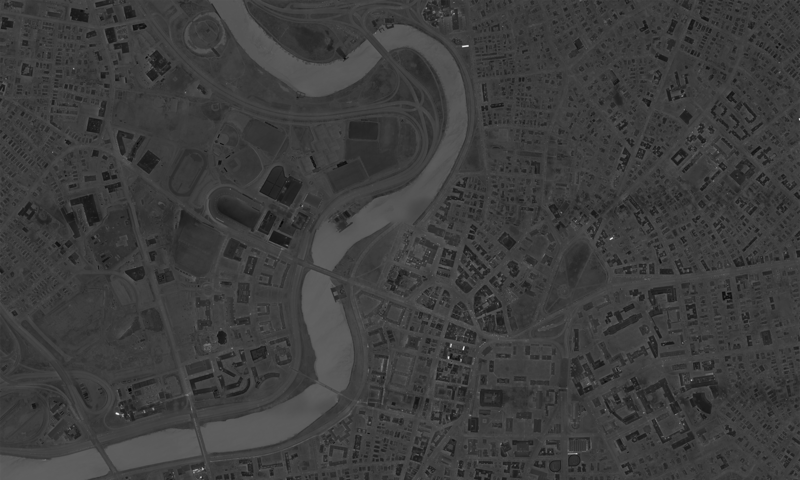 - Stockton Infrared Thermographic Services, Inc.
A flood along the Mississippi, as seen from on high. The US Army Corps of Engineers detonated explosives at the Birds Point levee near Wyatt, Missouri, at 10:02 p.m. on May 2, 2011. Water from the intentional breach flooded a 130,000-acre stretch of land. Two more breaches were detonated on May 3 and 5. This image from the Advanced Thermal Emission and Reflection Radiometer (ASTER) instrument on NASA’s Terra spacecraft shows the resultant flooding of farmland west of the Mississippi 20 miles (32 kilometers) south of the levee breach. On the image, vegetation is displayed in red, bare fields in gray and water in blue. The image covers an area of 30.7 by 39 miles (49.5 by 63 kilometers), and is located near 36.5 degrees north latitude, 89.4 degrees west longitude. With its 14 spectral bands from the visible to the thermal infrared wavelength region and its high spatial resolution of about 50 to 300 feet, or about 15 to 90 meters, ASTER images Earth to map and monitor the changing surface of our planet. ASTER is one of five Earth-observing instruments launched Dec. 18, 1999, on Terra. The instrument was built by Japan’s Ministry of Economy, Trade and Industry. A joint US/Japan science team is responsible for validation and calibration of the instrument and data products. The broad spectral coverage and high spectral resolution of ASTER provides scientists in numerous disciplines with critical information for surface mapping and monitoring of dynamic conditions and temporal change. Example applications are monitoring glacial advances and retreats; monitoring potentially active volcanoes; identifying crop stress; determining cloud morphology and physical properties; wetlands evaluation; thermal pollution monitoring; coral reef degradation; surface temperature mapping of soils and geology; and, measuring surface heat balance.